Thomas Howard "Tom" Kean, Sr. (/ˈkeɪn/; born April 21, 1935) is an American Republican Party politician. He served as the 48th Governor of New Jersey from 1982 to 1990. ↑ Felzenberg, Alvin S. (2006). Governor Tom Kean. Rutgers University Press. p. 5. ISBN 978-0-8135-3799-3. From the time James Kean arrived in South Carolina, the Keans took pains to retain the proper pronunciation of their name, which rhymes with rain rather than with green. 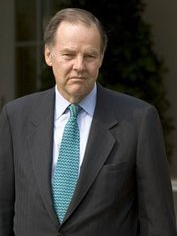 Thomas H. Kean biography at 9/11 Commission Official Web Site. New Jersey Governor Thomas H. Kean biography, National Governors Association. Governor Tom Kean, a biography by Alvin S. Felzenberg, Rutgers University Press. "A View from Outside the Beltway: Winning Policy Themes for the 1990s", by Thomas Kean, Heritage Lecture No. 357, Heritage Foundation, December 15, 1991. "9/11 Panel Suspected Deception by Pentagon", The Washington Post, August 2, 2006. "Stonewalled by the C.I.A. ", op-ed by Kean and Lee H. Hamilton, The New York Times, January 2, 2008. Thomas Kean interview on CNN's "The Situation Room" regarding CIA's refusal to disclose al-Qaeda interview tapes to 9/11 Commission, January 2, 2008 at YouTube.